You wouldn’t want to meet this scary SUV in a dark alleyway. The Mercedes-AMG GLS63 isn’t a very subtle SUV, but that hasn’t stopped the aftermarket tuner Mansory from working its magic and having a crack at making the three-row SUV even more malicious. As with most Mansory tuning jobs, the modifications will no doubt be polarizing, but you can’t deny that this is one angry looking SUV. As if the GLS63 wasn’t already large enough, Mansory has extended the body by widening the front by 25 mm and by 40 mm at the back - and that's just for starters. Most of the added aggression can be attributed to the brash body kit, including a new front bumper with larger air intakes, a lip spoiler and integrated daytime running lights. As well as making the SUV look more menacing, Mansory says the new side skirts improve the airflow, and a rear spoiler and distinctive diffuser has been fitted as well. The tuner also scrapped the standard hood and replaced it with a lighter one with extra gills to enhance the cooling of the uprated engine. Speaking of which, the standard Mercedes-AMG GLS63 was no slouch, thanks to its 5.5-liter, twin-turbo V8 producing 577 horsepower and 561 lb-ft of torque. For most, that level of power in an SUV would be ample. 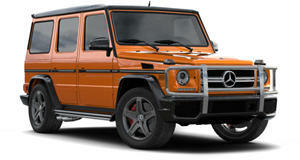 Mansory clearly disagrees, however, as the 5.5-liter V8 has been tuned to deliver a whopping 830 hp and 848-lb-ft. The tuner isn’t saying how this affects the 0-60 mph sprint time, but claims it will increase the top speed by 28 mph to 183 mph. The cosmetic changes may not be to everyone’s taste, but its potent performance more than makes up for it. Elsewhere, those muscular wheel arches house massive 23-inch wheels, which ride an inch closer to the road thanks to a lowering module for the pneumatic suspension which “significantly improves the handling during fast cornering”, and the interior has been lavished with a new carbon fiber-covered sports steering wheel and lots of leather and Alcantara.